In this issue, we are glad to share a collection of new publications released by the International Policy Centre for Inclusive Growth (IPC-IG), ranging from a review of strategies to promote child and gender-sensitive outcomes in cash transfer programmes, to a study on income concentration in Brazil. We also bring you the latest news and updates regarding the IPC-IG's activities. 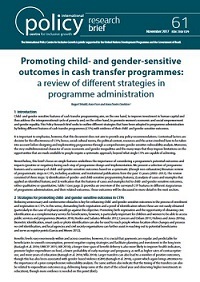 In the Policy Research Brief "Promoting child- and gender-sensitive outcomes in cash transfer programmes: a review of different strategies in programme administration", the authors Raquel Tebaldi, Anne Esser and Anna Davies Davidsen (IPC-IG) present a selection of programme features and a summary of child- and gender-sensitive outcomes based on a systematic literature review of programmatic steps in cash transfer programmes, including academic and institutional publications from 2002 to 2017. This publication in available in English and in Portuguese. In the Working Paper “The concentration of income at the top in Brazil, 2006-2014”, Pedro Herculano Guimarães Ferreira de Souza and Marcelo Medeiros (Institute for Applied Economic Research—Ipea) assess the level and trajectory of top income shares in Brazil—from the 0.1 per cent to the 10 per cent at the top—between 2006 and 2014, and contrast the results against those from the National Household Sample Survey (Pesquisa Nacional por Amostra de Domicílios —PNAD) and from the international literature. This publication is available in English, and an accompanying One Pager is available in English and in Portuguese. "Is a country’s ability to generate and distribute income determined by its productive structure?" is the title of this interesting One Pager penned by Dominik Hartmann (Fraunhofer IMW and University of Leipzig), Cristian Jara-Figueroa and Cesar Hidalgo (the MIT Media Lab). The authors seek to answer this question by reviewing the literature on the connection between a country's level of income and its level of income inequality. This publication is available in English and Portuguese. We are also glad to share the report on the International Seminar on Linking Climate Change and National Accounting, jointly organised by the IPC-IG, Ipea, the Institute Climate and Society (ICS), ECLAC and the Brazilian Government, in Brasilia, on 17 October 2017. The seminar discussed how national accounts can be used and adapted to monitor national policy responses to climate change, such as programmes designed to mitigate greenhouse gas emissions, among other issues. This report is available in English and in Portuguese. The One Pager “Conceptualising shock-responsive social protection”, by Valentina Barca (Oxford Policy Management—OPM), is now available in French and Spanish. It was previously published in English. This One Pager presents the overarching conceptual framework that informed a recent global study on the topic. Following up on shock-responsive social protection, OPM and the online platform socialprotection.org will organise a webinar to discuss the study’s findings, including minor changes to the framework building on new evidence, in January 2018. Stay tuned! The One Pager “Designing public works programmes for protection and growth”, by Rodolfo Beazley and Anna Vitali (OPM), is now available in French. It was originally released in English. The One Pager “Familial effects on youth smoking in Brazil”, by Alberto Palloni (University of Wisconsin–Madison), Laetícia De Souza (IPC-IG) and Letícia Junqueira Marteleto (University of Texas) is now available in French. It was previously released in English and in Portuguese. The One Pager “An overview of social policy in Brazil (2004–2014)”, by Patrícia Andrade de Oliveira e Silva (Ipea), is now available in French. It was previously released in English and in Portuguese. The One Pager “The unseen gender impact of conditionality: extra-official conditions An overview of social policy in Brazil (2004–2014)”, by Tara Patricia Cookson (University of Cambridge), is now available in French. It was previously released in English. The IPC-IG will join the Global South-South Development Expo (GSSD Expo) 2017, which will be hosted by the Republic of Turkey, in Antalya, from 27 to 30 November. Organised by the United Nations Office for South-South Cooperation (UNOSSC), the theme of this Expo will be “South-South Cooperation in the Era of Economic, Social and Environmental Transformation: Road to the 40th Anniversary of the Adoption of the Buenos Aires Plan of Action (BAPA+40)”. The Centre's Senior Project Officer, Mariana Balboni, will represent the IPC-IG and the online platform socialprotection.org on the booth at the Expo. The GSSD Expo is designed to showcase successful evidence-based development solutions and initiatives created by institutions of countries from the global South to address development challenges. Solange Gonçalves, IPC-IG Research Associate, participated as a speaker at the Latin American and Caribbean Economic Association (LACEA) and the Latin American Econometric Society (LAMES) annual meetings, held in Buenos Aires, from 9 to 11 November. 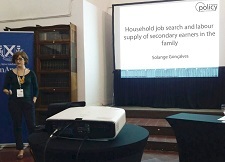 Ms. Gonçalves presented the paper: “Household job search and labour supply of secondary earners in the family”, which is one of the subjects of her thesis. Raquel Tebaldi, IPC-IG Researcher, participated in the Regional Seminar on Shock-responsive Social Protection in Latin America and the Caribbean, organised by the World Food Programme (WFP) in partnership with the Ministry of Foreign Affairs and the Ministry of Social Development and Inclusion of the Government of Peru, in Lima, from 30 to 31 October. The online platform socialprotection.org provided the livestreaming of the sessions—watch here. As part of the IPC-IG's work to strengthen national capacities on monitoring and evaluation in the social protection sector in Angola, the Centre is participating in a mission to Luanda and Uíge, from 20 November to 8 December. The Centre's Research Associates Alexander Cambraia and Santiago Varella will implement a Monitoring and Evaluation (M&E) training programme on social protection policies, aimed at qualifying technicians of the Government of Angola. The team will also work to systematise processes and to structure a monitoring and evaluation system for the Angola Social Assistance Municipalisation Plan (Plano de Municipalização da Assistência Social SUAS), which is under development in the country. The IPC-IG will join the Brazilian National Meeting of State Coordinators of the Single Registry (CadUnico) and the Bolsa Família Programme (BFP), organised by the Ministry of Social Development, in Brasília, from 27 to 30 November. The Centre's Senior Research Coordinator Rafael Osorio and IPC-IG Research Associate and Ipea Researcher Luis Henrique Paiva will join the opening panel to talk about the dynamic vision of poverty and sustainable development goals (SDGs): contributions from the BFP; and trends and perspectives of the cash transfer programmes in Latin America, respectively. If you want to learn more about the Brazil’s Single Registry and the BFP, click here for a selection of studies published by the Centre.